The Review: An unknown organism has gone loose on a space station, leaving behind empty hallways and stories of those who used to work there. If this premise seems original to you, you've been living under a rock for the past few decades. Even some recent Duke maps have been playing with the premise. But they, it's there simply to set things up as you plunge into the map. Sanek, who recently experimented with platforming in much happier circumstances, has gone for a more story-driven experience this time around. 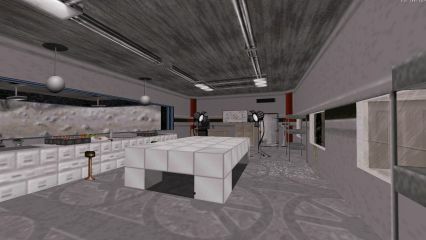 The story is conveyed to the player via the usual method: viewscreens. I'd estimate that about 30% of the map consists of reading through lines and lines of text. The story is not bad at all, but the map is much too short considering the amount of time spent on reading, giving the impression that you're just going from viewscreen to viewscreen while shooting a few things (or pressing a few buttons) in between. Things do start to heat up toward the end, but then it's just over rather quickly. It'd also have helped a lot if there had been scripted sequences and puzzle elements not dealing with hunting for key cards and buttons (some hidden); a map of this nature simply demands more, especially considering the intriguing way things are initially presented to the player. Design is quite good (albeit blocky) when it comes to details, spritework and lighting, but there could have been more views of the station and its surroundings through the windows: instead, the very first post-airlock corridor seems to suggest the entire station has vanished (as if Lunar Apocalypse never existed). One aspect I did like was coming across locations hinted at earlier in the crew's correspondence. As a last point, the map's selection of enemies is a good one despite (or because of) doing away with the traditional troopers, Pig Cops and Enforcers. The selection not only sits in well with the story but also presents a novel type of challenge - or have you ever considered protozoids anything but a small annoyance? Conclusion: Dark Seed's atmosphere is spot on from the getgo and I like how the map does things slightly differently from the rest of the bunch with respect to combat. However, considering its short length way too much of the gameplay is about reading through correspondence and solving traditional puzzles, and despite all the reading, the map still ends up feeling incomplete. This is the kind of a map that absolutely needs a more extended development time. Overall, Dark Seed is still a good map, but there was potential for so much more.